Protecting Our Communities. Watching the Watchers. What are the risks of living near abandoned uranium mines? Are these aging reactors leaking any radiation? Is it ok to let our children play outdoors all day? We have no way of knowing without proper equipment. Through crowdsourcing, we intend to raise $15,000 to buy 10 radiation detectors, distribute them throughout the contaminated and frontline communities in the US, and secure the professional training needed to learn how to detect and interpret radiation. NEIS.ORG and direct your donation towards "Radiation Monitoring Project" under the designation menu. This is a project of Diné No Nukes, Nuclear Energy Information Service and Sloths Against Nuclear State. 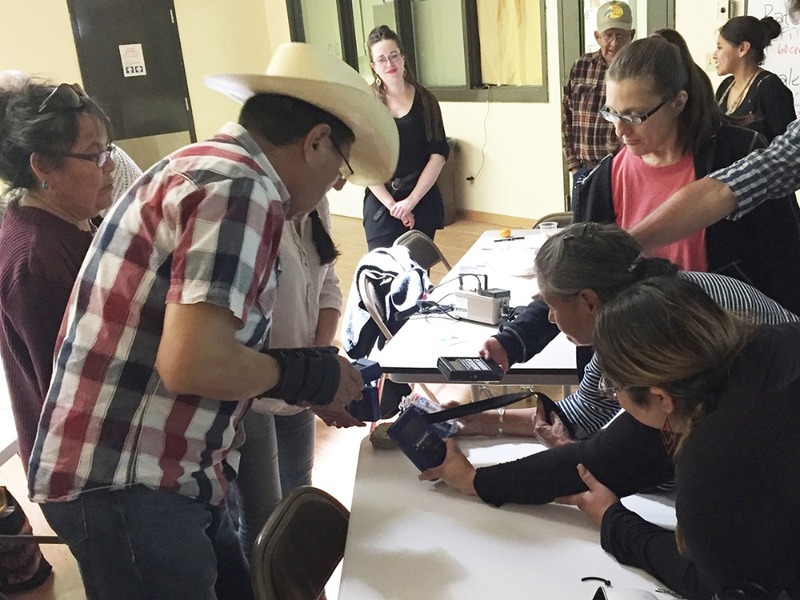 On April 7, 2016 the Radiation Monitoring Project (RMP) hosted the first Southwest workshop, focusing on Diné (Navajo) communities on the edge of the Navajo Nation in Sanders, AZ. In the 8-hour long session, we covered radiation physics, health effects of six specific isotopes unique to uranium production, how to properly monitor radioactivity, what kind of data to collect, and how to protect yourself from sources of radiation. Led by three instructors Lucas Hixson, Cindy Folkers, and Chris Shuey, we spent the day running through 3 days worth of information. After the intensive classroom session and hands-on monitoring training using radioactive samples, we took our monitoring devices to the nearby Puerco River. In 1979, the United Nuclear Corporation uranium mill tailings spill into the Puerco caused a large-scale radioactive disaster which originated north of Churchrock, NM and continues to contaminate the local water supply today in Sanders, AZ and other communities downstream. 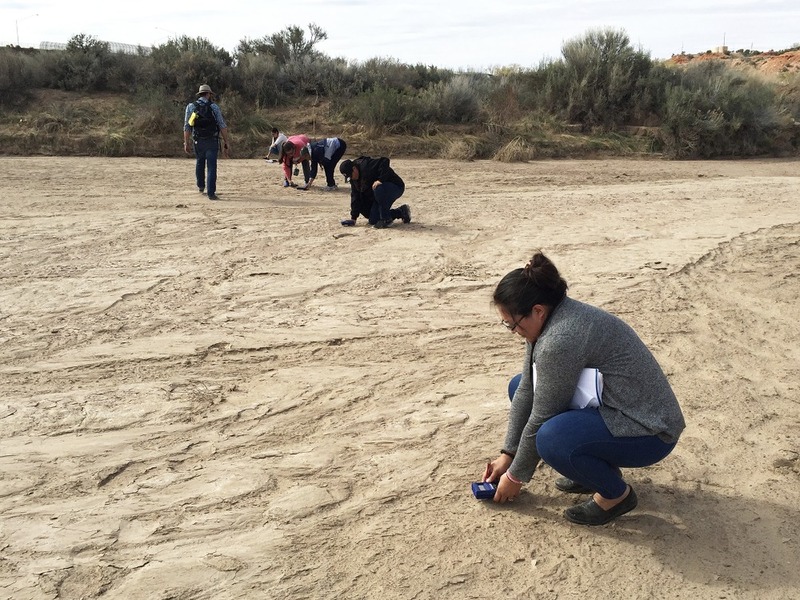 Using the Inspector-USB radiation detector we purchased with crowd-sourced funds, participants practiced monitoring and recording data on the Puerco’s riverbed. At the end of the training, RMP distributed five monitors to community members from throughout the Four Corners Region who will use them for several months to monitor the environment surrounding their homes and in areas of concern. We are committed to continue collaborating with these communities to develop skills in monitoring and understanding radiation in order to help defend the communities from contamination or naturally occurring sources of radiation. We’d like to thank the people of Sanders and the Nahata Dziil Chapter staff for welcoming us, as well as the many front-line community folks for traveling to the training and spending the whole day with us. We are overwhelmed by the enthusiasm to learn and to use these new skills and monitors in the field. Radiation Monitoring Project (RMP) is a collaborative project of Sloths Against Nuclear State (NY), Diné NO NUKES (NM) and Nuclear Energy Information Service (IL) which began in September 2014. During the past year we have raised funds to purchase 15 rad detectors and host 3 skill-share workshops on radiation in contaminated and front-line communities. If you are interested in getting involved, please contact us at RadMonitoringProject <at> gmail.com. NEIS hosted the first training session of the newly formed Radiation Monitoring Project (RMP) in Chicago on October 30th. Nuclear researcher Lucas Hixson of Enformable Environmental Services of Michigan conducted an intensive training for 10 eager trainees on the topics of radiation and the field use of monitors. The Chicago event was the first of what will be a series of trainings around the country sponsored by the RMP. The next trainings are tentatively slated to be held in Chicago sometime in January; and in Albuquerque in March, 2016. 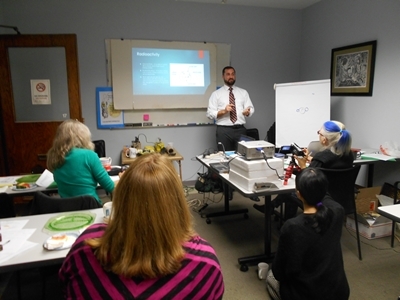 Hixson led participants through an intense classroom training on radiation basics lasting nearly five hours. This was followed for the next three hours by hands-on training using the monitors provided by the Project to take readings on selected radioactive samples Hixson provided. An edited video of the training will soon be available on the RMP webpage hosted on the website of Diné No Nukes of Albuquerque, NM. On behalf of Diné No Nukes, Sloths against Nuclear State, and Nuclear Energy Information Service, I am very pleased to let you know that YOU helped us reach our target of $15,000 to purchase radiation monitors for front line communities. In all, nearly people, groups and foundations have contributed to this project so far, with new contributions continuing to arrive daily. And, we just purchased our first five monitors, with five more to be ordered. We want to emphasize the fact that we could not have done this without people like you! You people are just SO special. Thank you for being there. We – YOU – make a difference, all the time! Be sure to tell your kids that. We will continue to take contributions for the Project on both the GoFundMe site, and on the NEIS “Donate Now” page. To date we’ve taken in about $16,500, which means we will be able to purchase MORE monitors and training than originally planned. So, there is still time to do good if you have not contributed yet and still want to. There may be some terrific individuals working at NRC or EPA, or in state government, but we must realize – these agencies are often co-opted, rolled, or bought off by the industries they regulate. In the end we have only ourselves to rely on with any certainty. You helped make that possible, once again. Thank you. Be well, and do great things! Only small amount today - but a good campaign!